“No, I’m bad,” groaned the middle-aged white man in the audience of the “White Accountability” workshop at the White Privilege Symposium. Despite my membership in the anti-racist, woke choir, I couldn’t help but wince—not for the last time that day. I believe white privilege exists—even, to an extent, for Jews like myself—and applaud forums where folks can have the nuanced and often uncomfortable discussions so often lacking in today’s political climate. As a long-term equal rights advocate, the vast majority of my political views put me far left of liberal. However, after a decade and a half participating in (and sometimes instigating) one botched campaign after another, I have retired from activism to focus on my writing. My favorite topic? Why activist movements fail. Given that polls have found that 54 percent of American whites simply don’t believe they have many—if any—societal advantages, it’s fair to say that those of us who want people to check their privilege have a problem. I attended the conference to investigate whether the anti-racism movement’s recent messaging and tactics might be improved upon. Over the course of the workshop, the presenter conducted plenty of sober analysis. She reminded us that employing the concept of privilege is not about attacking anyone, but just creating “awareness about the realities of society”—a far cry from blaming people for the sins of their great-great-grandparents. She also admitted that “oppressed people can be oppressors” too, acknowledging that, no matter what our identities are, we’re all part of the problem and can be part of the solution. But when she started throwing around the term white feelings—as if the emotions of Caucasians differed from those of other races—I got antsy. As I did when she explained that when we debate some aspects of racial injustice, we “take time away from the real issue”—an attitude which is the polar opposite of being open to dialogue. As much as I cringed at these statements, I can only imagine how the average white American would react. Then the presenter said something that literally made me gape: “Racism is a white creation.” Not, white people birthed modern racism or even white people invented the worst kind of racism, but that they came up with the phenomenon itself. Since all but two of the attendees were white, the statement could technically have applied to almost anyone in the room, including the presenter and Lucy herself. However, her goal was clear: to get this man to shut up—which he instantly did. An influential local figure who obviously cared enough about racism to pay $145 to attend the conference, the archaeologist was someone we should have embraced, rather than shamed and silenced. Nevertheless, at lunch, I found him sitting alone at an otherwise empty table. One of the most effective things a movement can do is critique itself from the inside, vetting anything that, once unleashed on the outside world, might needlessly turn people off the cause. Here was a perfect opportunity to do just that. Yet, sadly, not only is criticism from within unwelcome, it’s typically met with hostility. Leftist activists don’t react this way because they’re bad people. On the contrary, what with the long and cruel history of racism in this country, it’s not unreasonable for well-meaning folks to feel threatened by someone who appears to be attempting to downplay its impact. Yet, if the anti-racism movement is interested in persuasion, this kind of emotional thinking and its resulting outbursts have got to go. The day’s second workshop was entitled “Hot Buttons and Triggering Events: Increasing Our Capacity to Respond Effectively.” Much to my surprise, the presenter asked a roomful of social justice warriors why they found themselves triggered so easily and often. The fact that this workshop was so popular I had to sit on the floor proves that many anti-racism activists are open to improvement. (Lucy, however, did not attend.) The presenter had us look at “common unproductive reactions during difficult, triggering situations,” asking us to make a check mark in front of any responses we may have witnessed in others and an asterisk in front of those we’ve experienced ourselves. If Lucy had been there, would she have owned up to “dismissing or minimizing the comments of others,” “intentionally trying to embarrass others,” or “bullying others into submission” when she called out the archaeologist? We were also invited to think back to a specific triggering event and investigate the “intrapersonal roots” of what might have made us feel that way, including illness or fatigue, the cumulative impact of similar experiences and/or past traumas. Perhaps Lucy might have been led to consider whether she was actually reacting to the archaeologist’s points, or whether he simply reminded her of someone else in her life—a former professor, say, or her father—who had the annoying habit of lecturing her. The presenter then encouraged us to ponder any “unmet needs” or “ego-driven desires” that may have contributed to our triggering. Did a lack of recognition cause Lucy to seek attention? Was she hoping to make the archaeologist “feel the pain and hurt” she had suffered? Or did she crave control, or want to be seen as an ally? Lucy is hardly the only person whose hair trigger harms the very causes she cares so much about. In what ways have my own turbulent emotions impacted the writing of this essay? Am I trying to force change within the movement? If so, is this due to my unmet need for fairness? My ego-driven desire to make people learn? My wish to influence other people’s views, feelings or behavior? Perhaps the inclusion value that both Lucy and I can most benefit from is to meet the people where they are without judgment. As satisfying as it feels to attack those you disagree with—whether fellow social justice activists, Trump supporters or bona fide white nationalists—if you’re not inviting someone to join you, all you’re doing is pushing them further away. Josh Schlossberg is an award-winning investigative journalist and recovering activist based in Denver, Colorado. I would say “racism is a white creation” is indeed correct, just not in the way the speaker probably meant it. The idea that racism exists and is a bad thing very much stems from the western enlightenment. Throughout most of the world, throughout most of history, xenophobia of one sort or another has just been the default setting, it is only really in the postwar west that large numbers of people have come to think that maybe it isn’t right. In feudal Japan, the lowest class were those who dug graves and did other unsanitary work. All Japanese, so they look the same. Even today, parents do family geneologies on prospective son-in-laws to make sure their ancestors were not part of that class. Don’t tell me whites invented racism. By focusing on those with advantages, the conversation is made useless. No black person can do anything about any advantages rich white people have. What they can do something about is their own situation, as can anyone who faces disadvantages. In college my neighbor was blind (married) and in school. He and his blind friend would try to get to and from school on the bus without help, though they sometimes had to call his wife to come get them. I never heard him complain. There was an essay I read where a young black man decided for some reason to put on a coat and tie and go about his business for a day. He found that people held the door for him, smiled at him, were nice. He didn’t seem to grasp that this reflected the fact that people dressed sharply are usually respectable, not dangerous, and are even the sort you turn to for help. He had stumbled across the fact that white people are not just reacting to skin color but to signs of deviant/criminal behavior, which they are scared of for good reason. I have (legal) immigrant friends and they dress nice, have an immaculate house. My black neighbor dressed much sharper than I do and never had problems with people or the cops. Such actions can help those with disadvantages a lot. Getting tattoos, dressing like a bum, having an attitude, showing up late to work, are NOT what someone with disadvantages should do to get ahead. Everyone has disadvantages. If you are not strong you can exercise. Everyone can read to become knowledgeable. Take Toastmasters to learn to give speeches. etc. One thing that the SJWs do not take into account is that many white people have had to work extremely hard to get where they are. Things were not handed to them. My friend in college lived in his old beat up van throughout college in order to attend. He would shower at the gym. My last 2 years of college I studied so hard and worked a job that I had almost no social life. Some people work 2 jobs. Everyone suffers in life and if you accuse people who have black friends, who are nice to everyone and help people, of being racists, you are just going to make enemies. When the far left talks about white people inventing slavery, they’re not joking. The concept of “race” was birthed by the Enlightenment. Before that, there wasn’t any racism, just Christians and heathens. But the white man came up with the idea there is “objective truth” and used it to oppress peoples of color. The Enlightenment’s ontology, rooted in the new science of the 17th century, created a vision of human beings in nature which provided weapons to a new race-based ideology which would have been impossible without the Enlightenment. White supremacy as enabled by the Enlightenment is most commonly conceptualized as a way for lower-class whites to feel socially superior to people from other ethnic backgrounds. More important, though, white supremacy is a tried-and-tested means for upper class whites to grow their wealth and power. The reality is that all the West has ever given the world is racism, slavery and oppression. This thought is all over the place on the Left and I am astonished that you are not familiar with it. We’ve been conditioned to simply blame white people, but Africans sold their own people into slavery for profit. Less than 5% of slaves were even brought to the US, and those brought to the US benefited from better treatment and much higher life expectancies. 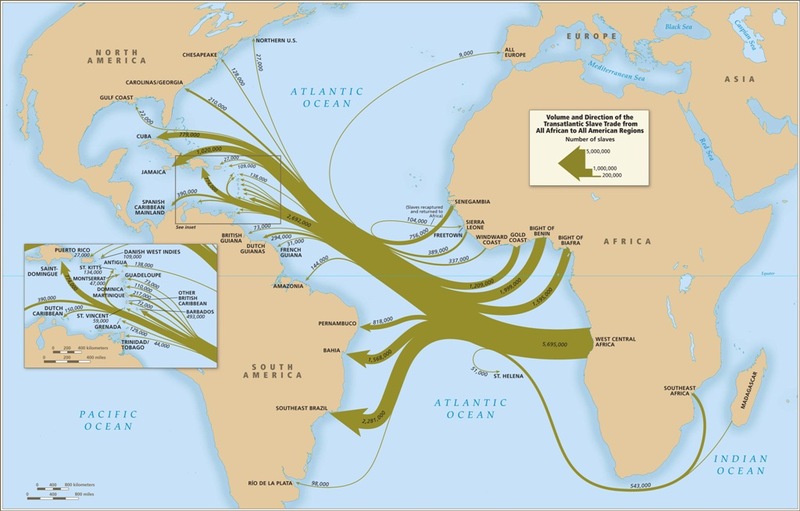 Given the alternatives, a slave was extremely lucky if they ended up being sent to the US. The US was a predominantly white nation, but black people and Native Americans also owned slaves, and Native American tribes continued to own black slaves even after the US abolition. Of course none of this encourages “white guilt” so don’t expect to hear about it in college. In fact we know LOADS about slavery and the slave trade, going back thousands of years. It’s just that no one is particularly interested in any aspect of slavery apart from white people buying and selling black people. Black people selling each other? Not interested. Arabs selling blacks. Boring. Blacks selling whites? Boring. Whites selling whites? Boring. Whites selling blacks? Oh, how fascinating and relevant! There are more slaves today than there ever were at any one time in the United States. The majority of those slaves being Africans enslaved by Africans. The wikipedia page on Apex fallacy was deleted some years ago at the insistence of feminists. I think you’re misunderstanding the concept of “white privilege.” It’s obviously true that some whites are more privileged than others: the CEO of Amazon has far more power than a temporary worker at a fulfillment center. It’s also true that powerful people of color (e.g., the Obamas) are much better off than impoverished whites. White privilege does not entail that all whites are equally privileged or that all whites are better off than all people of color. Instead, it reflects the fact that you’re better off (on average) being poor and white and being poor and black — and the same applies if you’re working class, middle class, or wealthy. Although the U.S. has made tremendous progress toward overcoming racism, many people still harbor unconscious biases which affect (for example) hiring decisions. Also, there’s a massive gap in average wealth become whites and people of color, much of which derives from historical discrimination which locked blacks out of the housing market. Unconscious bias and the tools used to measure it have been demonstrated to have essentially no validity. “create safety for the expression of differing viewpoints”. The fact that people need to sit in a room and be presented with steps for how to tolerate the fact other people may not agree with them, tells you all you need to know about the ideology. What is 9/10 nothing more than the expression of ideas, get couched in the language of trauma and having people say and write stuff that diverges from your world is now apparently something to survive.